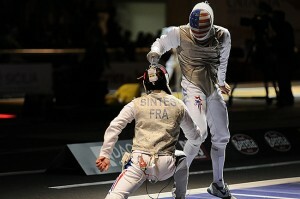 Down 11-8, Imboden found his attack and brought the bout to tied at 11-11. After trading touches, Imboden went ahead 14-13 and then scored on what was called a parry-riposte. The referee tossed out the touch. Race, who thought he had already won, had to get his head back in the game quickly. Right on the next “Allez” Joppich launched an attack to tie the bout 14-14 with under 30 seconds left in the 2nd period. Race continued to press, landing several off-target attacks against Joppich’s counter-attacks. Finally, Race attacked, Joppich caught the parry but missed his first riposte, Race’s action landed followed by Joppich’s remise. 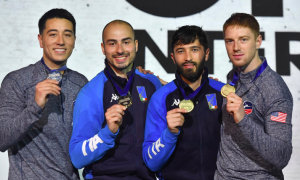 Since the touch was 14-14, it went immediately to video review and the referee initially indicated for Joppich, but upon further review the the point was awarded to Imboden. 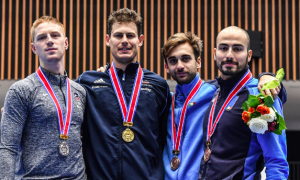 This is Imboden’s first top-8 appearance, and the best of the US Men’s Foil fencers. 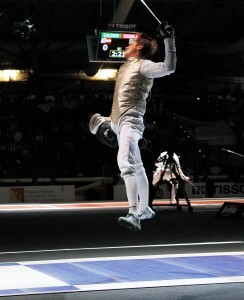 His best result so far this season was 16th at the St Petersburg Grand Prix in June. 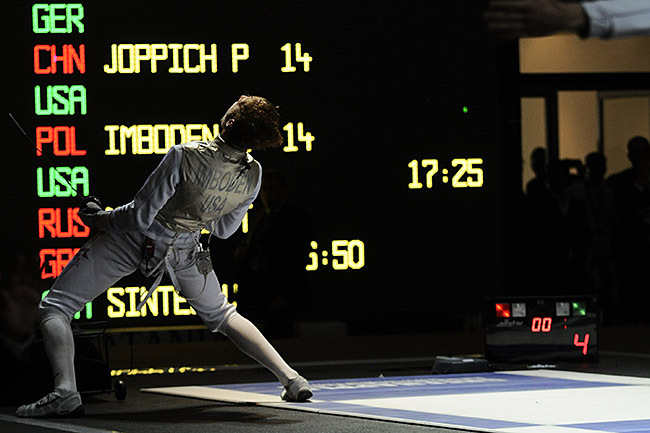 Imboden will face Victor Sintes (FRA) in the final-8. Gerek Meinhardt lost to Sintes in the 16, 15-9. Alexander Massialas lost in overtime 14-13 to Egypt’s Alaa El Sayed Abouelkassem to take 23rd. 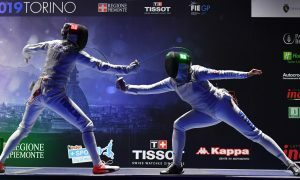 Miles Chamley-Watson lost is opening round bout 15-11 to Leszek Rajski (POL) to take 33rd.